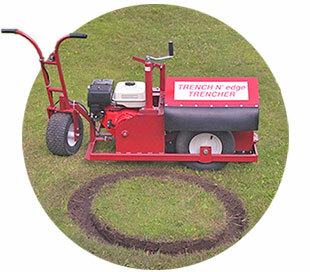 Patented Features | Trench'N edge Trencher. 2. Adjustable depth control mechanism. 3. Slotted linkage using sliding bolts. 4. Spring counter balance to help cutting blade retract. 6. Single front steerable wheel, cutting arbor mounted between rear wheels to avoid stress on the cutting blade by pivoting on the blade during tight turns thus decreasing engine RPM's and torque. Blade is centered directly in line with the front steering handle to help the operator keep straight trenches. Having the handle and cutting blade in line is extremely helpful in radius turns because the operator knows exactly where the cutting line is located. All other machines cutting blades offset from the handles which makes it tougher for the operator to do precision cuts in tight turns. 7. Steering wheel mounted directly to the pivot wheel for more control in turns. This handle is tiltable to act as a break in the down position or allows for compact storage and transportation in the up position. 8. The spacing between the rear wheels allows for multiple passes next to the original trench. Trenches up to 10" wide can be cut with the wheels mounted on the inside. Trenches up to 18" wide can be cut by mounting the wheels to the outside. 9-11. Teeth are replaceable as the main wear part. These teeth are attached to forged steel holders that are also replaceable. These parts are inexpensive with teeth costing only $7.50 or $60.00 for a new set of eight. The cutting arbor is available in 2 sizes , 12" and 16". The 12" is used for a combination of landscape and irrigation. This model can cut down to 6" deep by 5" wide or 7" deep 2 1/2" wide. The 16" size is for drip irrigation and low voltage electric line. This model can cut down to a 7" depth by 5/8" wide. 12-17. The cutting arbor deflector shield is so unique that it is the only trencher that fully encloses the cutting blade in 10 gage steel to protect the operator. This deflector housing can be set to discharge the material out of either side of the machine away from the trench. The material can be discharged onto tarps to avoid the additional labor cost of cleaning up trenched material from planting beds and lawns. This is the only trencher made that can clean-up after itself. Our patent application claims have been allowed for the issuance of Patent Number 5,964,049; Date of Patent Oct. 12, 1999.